Part of creating a Simple Happy Life will inevitably involve creating new habits and rituals so that your life feels better, more meaningful, more fulfilling, and so ultimately you feel happier. As well as creating new ways of behaving, getting rid of old, unhealthy patterns of behaviour can also be a crucial part of improving your life. We all have lots of things that we feel would really improve our lives if we did them, or if we stopped doing them. Little ideas and thoughts that pop up in our head, like exercising more, clearing our clutter, being more mindful, taking steps to change our career. But often we resist new habits because they feel so permanent. And hard. And maybe we aren’t sure that we want to say, give up sugar forever, but we want to get a handle on our biscuit habit. Perhaps we don’t totally see ourselves as someone who could run a marathon (and actually the idea freaks us out) but we do spend a lot of time beating ourselves up for not being fitter and would like to start running, but never get round to it. A good few years ago now, back in 2004 I came across the perfect way to handle this dilemma. At the time I was studying to be a life coach which involved a lot of reading, travelling to London for the weekend once a month for 3 days of intensive training and of course practicing my coaching skills on practice clients, about 4-5 hours a week. I also had a full time and fairly demanding management job and add to that the commute, shopping, housework and the like, I didn’t seem to have enough hours in the day. However, I DID seem to have enough hours in the day to watch TV, specifically soap operas. Oh I watched them all! Even Hollyoaks! And I toyed with the idea of giving up one or two of them. But didn’t. And then I came across the idea of the 30 day challenge. This involved committing to doing (or not doing) something, for just 30 days, no more, no less. It was pitched as a trial of a new habit you might want to cultivate, or to break, without making that big almighty decision to give something up forever, or become that person who ALWAYS did that thing. Up until that point I was a serial life changer/ giver upper type but I rarely stuck to things past a few days, maybe a week or so tops. I would get overwhelmed, or doubt my decision and that would be that. And as you might be familiar with this, you’ll know it doesn’t make you feel great about yourself either. You feel like a person who can’t stick with anything and that’s fairly demoralising. 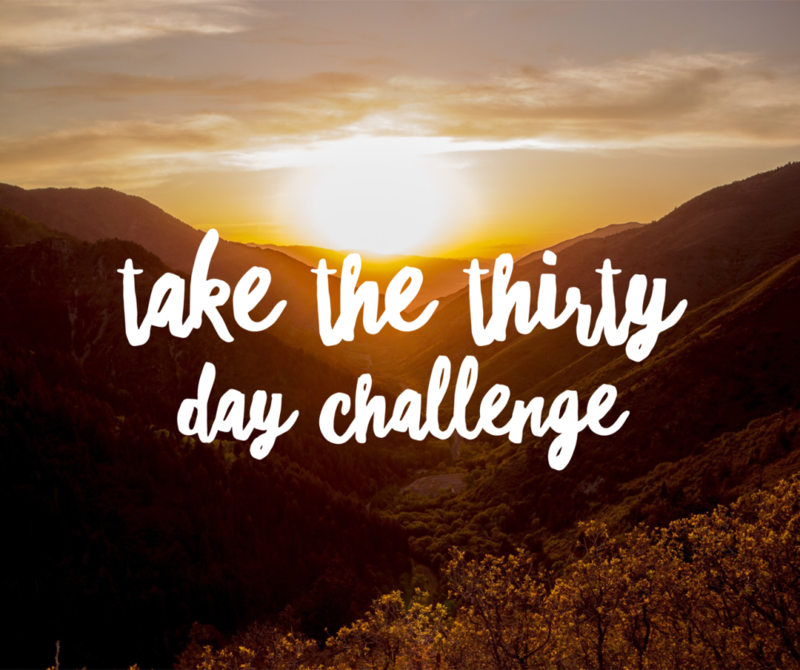 But this new 30 day challenge idea really appealed and I felt like I could achieve it no problem really, so I decided then and there, to give up soaps for just 30 days and see what happened. After all, how hard could it be? Well dear reader, I am happy to say that after 30 days, my fears of missing my shows and characters and wondering what was going on and who was doing what to, and with who, were totally allayed. I didn’t miss them at all. In that 30 days I had discovered that spending my time doing my assignments and actually other things too like cooking new recipes, starting a food blog and reading for pleasure as well as for my studies, was all so much more pleasant than nightly trips to Coronation Street or Albert Square. By committing so something for 30 days, you are giving yourself enough of a go at it and enough time to actually build a habit and incorporate it successfully into your lifestyle. But even if I had gone back to my soaps, or maybe picked a favourite show to pick up again, I would still have achieved something. I would have in just 30 days saved hours of my time and devoted it to other tasks and activities. Another time I decided to go for a walk every morning from 6am until 7am, in my local park. Again, I completed the 30 days and then decided, I didn’t really want to do it long term. So I didn’t, but I felt good that I had tried it out and it spurred me on to looking at other exercise options and I started to go to a regular yoga class instead. Does this all of sound good? Perhaps now is the time to get start a 30 day challenge of your own. I don’t know about you but August can sometimes feel slushy and unproductive, making it the perfect time to take up a challenge! But what to base your challenge on? 1. Eating – commit to a new healthy eating regime – maybe you want to try being vegan, or cutting out sugar? Or perhaps you want to stick to a certain calorie intake, or make your 5 a day target? 2. Exercise – how good would it feel to exercise for a set amount of time every day, either something you already do or try a new activity altogether – or mix it up! Call a friend or relative every day (thats call, not text or message) and have a 5-10 minute chat. Read – if like me you have a houseful of books but you haven’t got round to reading them, set aside 30 minutes everyday to read rather than watch TV or go online. So what will you do? I’d love to know so why not leave a comment or better still join me in the Facebook group? I’m going to do a 30 day challenge myself which I shall reveal tomorrow!